What's New in the Guild of Straw Craftsmen On-Line. This page details the changes made to the Guild web site. Changes will be in chronological order with the oldest changes at the end. The courses and events for 2010 have been added. At long last we can reveal who the author of the Corn Dolly poem is and why the author chose to remain anonymous. 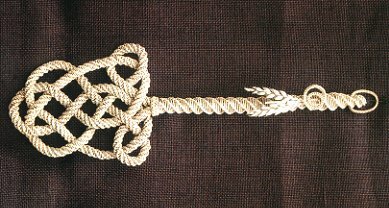 In response to enquiries received after the last episode of the Victorian Farm on BBC television (Thursday 12th February) we have put diagrams and instructions for the 7-straw flait plait, known as a Dunstable plait, on to the Projects page, together with a number of references. The 7-straw and the 5-straw flat plaits were two of the plaits most widely used in the straw hat industry. The first project of the year. Make a Glory Braid. The courses and events for 2009 have been added. The menu at the side has been expanded so that you can navigate directly to the sections in pages with many parts.